The Flexor hallucis brevis divides into two portions which are inserted into the medial and lateral sides of the base of the first phalanx of the great toe. Lateral part of the muscle originates medically to the cuboid bone and laterally to the cuneiform bone. Medial part of the muscle originates from the tendon of tibialis posterior. It is blended with the Abductor hallucis brevis to its insertion. 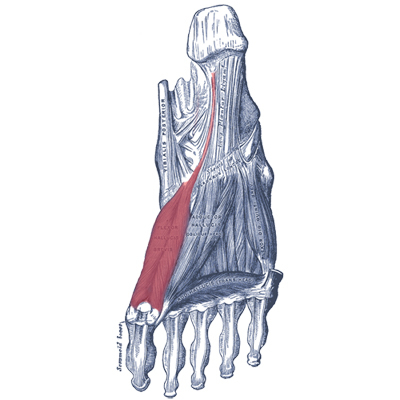 Both parts of the muscle are inserted on the hallux (sides of the base of proximal phalanx). The medial part pleads with the abductor hallucis muscle and the lateral part blends with the adductor hallucis muscle. The medial and lateral head of the flexor hallucis brevis is innervated by the medial plantar nerve. Both heads are represented by the spinal segments S1 and S2. Flexion of the great toe at the metatarsophalengial joint with the assistance of the flexor hallucis longus. Dysfunction of the flexor hallucis brevis will commonly present as pain in the ball of the foot when extending the big toe, difficulty and pain during gait and toe deformities. Aggravation of the muscle may occur when the second toe is longer than the other toes, walking or running on uneven ground, wearing high heels or shoes that are too small. It is nearly impossible to palpate the FHB muscle as it is located deep in the foot. (The third layer from 4 layers of the foot muscles). As usual, the FHB strength can be measured manually by MMT grading. Start the test by having the patient in supine/long sitting position with the foot hanging over the table. With your hand, hold the foot just below the ankle for stabilization and ask him/her to bend the big toe while you resist the movement by your fingers of the other hand and start the grading. Pulling the towel would always be the good option for strengthening the big toe and other four toe flexors, but make sure that the patient is using the FHB muscle so she/he should flex the great toe by bending it at the MP joint. You can progress the exercise by putting a little heavy object on the towel. Stretch the muscle by moving the big toe into hyper extension as much as possible, hold then relax. ↑ Helen J.Hislop Jacqueline Montgomery,Muscle Testing,2007,8th edition.